Educational summer camps at Back to Basics in Delaware… there's still time to sign up for 2015 camps! | Back to Basics Learning Dynamics, Inc.
Educational summer camps at Back to Basics in Delaware… there’s still time to sign up for 2015 camps! Back to Basics Learning Dynamics offers a full range of educational summer options just right for your student. Make summer count! Our week-long workshop for students in Grades 1-3 focuses on building excitement toward mathematics through hands-on manipulative activities, interactive math games, and exploration of math in daily life. Developing an early interest in math and motivating students to advance their math skills are critical at this stage. August 10-14, 2015 from 10:00 a.m.-12:00 p.m.
Our week-long workshop for students in Grades 4-6 focuses on exploring problem- solving strategies, along with mental math training and logical reasoning. The concepts involve critical thinking and help students to get excited about math in the future grades. How math is used in our everyday lives will be explored using real-life examples. This is primarily an enrichment workshop. July 20-24, 2015 from 5:30 – 7:30 p.m.
Our week-long workshop for students in Grades 7-8 focuses on expanding mathematical skills through subject-based material for pre-algebra, algebra, and geometry, enhanced with problem-solving topics in number theory, counting and probability. Through the exploration of these math skills, interest in science, technology, research, and community services will be peaked. July 13-17, 2015 from 5:30-7:30 p.m.
To learn more about the unique academic advantages of educational summer camps offered at Back to Basics Learning Dynamics, please contact us at 302-594-0754. Celebrating 30 years of excellence in education! Back to Basics Learning Dynamics is the undisputed leader in 1-on-1 tutoring in Delaware and southeastern Pennsylvania for over 60 subjects. 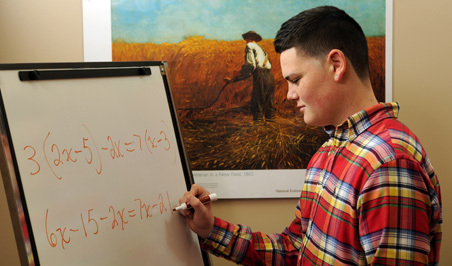 The company offers a unique Department of Education-approved 1-on-1 K-12 Private School in Wilmington, Delaware and a Delaware Business and Trade School for ages 16 and older. In addition, the company offers translating and interpreting in 16 languages throughout Delaware. Back to Basics is the winner of numerous awards for academic and business excellence including the Better Business Bureau Torch Award for Marketplace Ethics. Back to Basics offers exceptional 1-on-1 education options for Summer 2015! Back to Basics Learning Dynamics and Renascentia Hall partner to help international students succeed! Graduating high school seniors in Delaware: The $500 Dr. Leroy Christophe Memorial Scholarship deadline is April 1! April is “Drop Everything and Read Month.” Here’s a list of must-read children’s books in preparation!